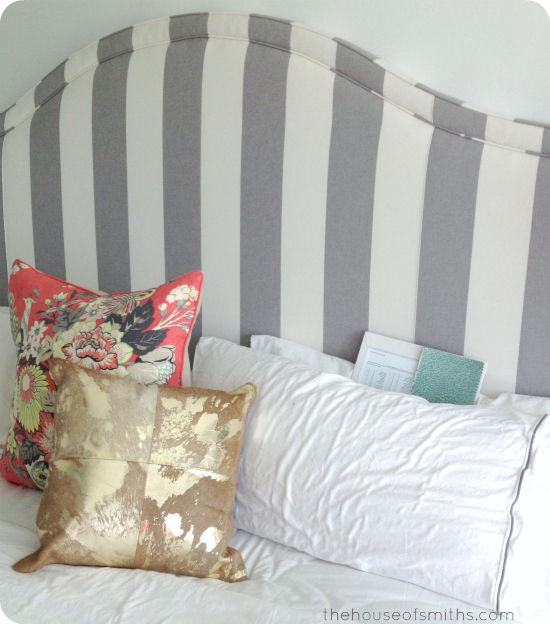 Dear Master Bedroom - You're cool with Coral, Stripes and Gold...Right!? You know that moment, when you're walking through a store, or browsing through a boutique and you turn a corner, or take a far glance past something right in front of you, and immediately see... IT. You know. THAT THING YOU HAVE TO HAVE. Irrational thoughts start buzzing in your brain. You instantly put a price tag on said item that is WAAAAY more than you would ever dream of paying, JUST so when you actually hear or see the amount, you can justify buying it, because it's "much lower than you had thought it would be in the first place!" ??? As you can guess, for me, 90% of the time that "thing" falls into the home decor category. The other 5% is children's clothing and the leftover 5% is baked goods. Judge me not. Really though. If you don't know what I'm talking about, or you have already rolled your eyes, just stop reading, because you probably won't be able to relate to the rest of this post. About a month or two ago, while shopping at The Black Goose, I was busy flipping through fabric samples, trying to decide which of them would make a possible good base for our bedrooms "grand master color design plan", when Cason popped over casually with "THE ITEM" in hand. 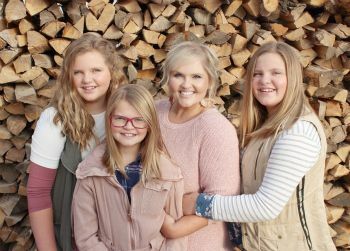 thanks to Aubrielle's latest works. I was SHOCKED that he actually liked the colors/design! I would have thought it was too floraly, too bright, too bold, too coral... you name it. But nope, he liked it because it was like nothing else we had in our house. SCORE! I was 100% set on now using this pillow as the design inspiration for our bedroom, that is, until I saw the hefty price tag. SHEESH! Who knew that fabric could cost that much!? I can't remember the exact total, but I know it started with a 1 and then there were two numbers behind it. YIKES! Even with my awesome coupon I had at the time, I was doubting this purchase. 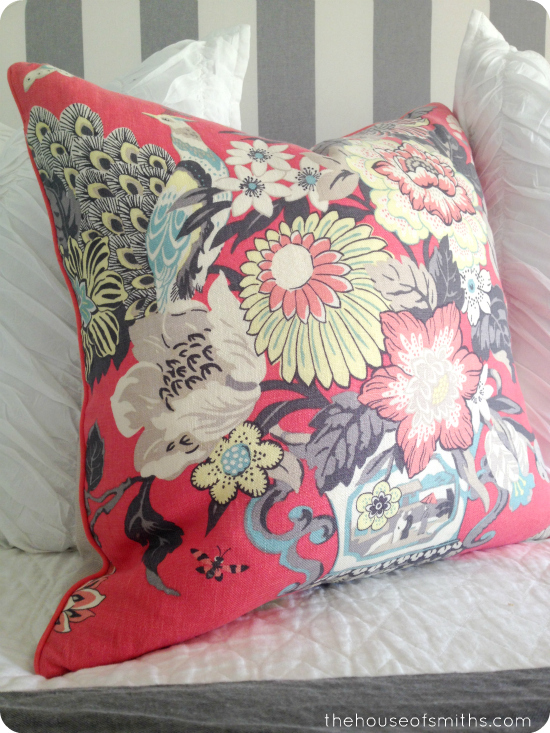 I took a bit longer to think about the pillow, and even tried to pull a bunch of other options that could be close contenders, but in the end, I just couldn't get this fabulous print out of my mind... so, it's now what's fueling the fire for everything else in our master bedroom space. Since living in our home, I feel like our master bedroom has never really gotten the FULL attention it's deserved. 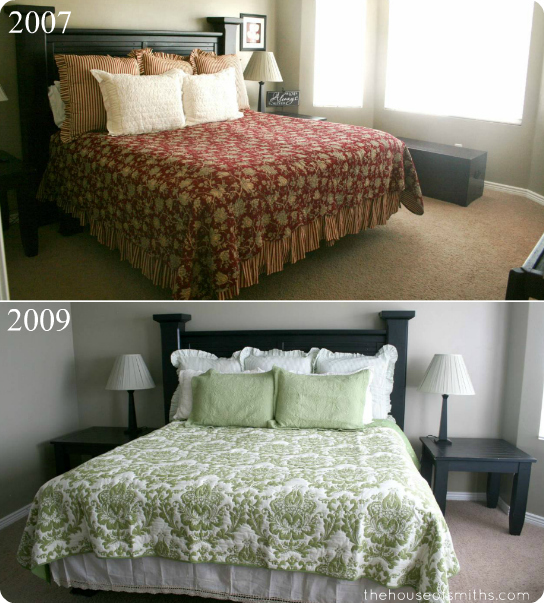 I've attempted "room makeovers" about 3 different times, but always lacked the motivation and inspiration to keep moving forward. I think it's because I've constantly played it safe; never doing what I've REALLY wanted to. But one things for sure, no matter what, I've always had some kind of nice bedding. 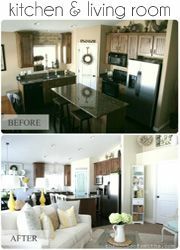 It's an area in home design that I feel really passionately about. For me, I feel like the bed/bedding in a room is the MOST important. Not only because it defines the overall style and look of your room, but because we spend so much of our time there, and it's usually the main focal point of the entire space! I don't just want our bed to look great, but I want it to FEEL great too. Sadly, we need a new mattress like you wouldn't even believe, but in case you didn't know, it's insanely hard to shop for one, especially when you and your husband have completely different ideas of what "comfortable" is. So... after wasting our time doing THAT for a few weekends, we decided to put it on the back burner, and just work on the actual beds "decor", first. A decision for us that was much easier to nail down. PS: If and WHEN we get a new mattress, we'll let you know what we end up deciding on. 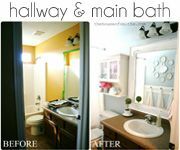 We both wanted our master bedroom to have a clean, comfy, spa-like vibe, sort of similar to what we created in our master bathroom makeover. Cason wanted ALL white bedding, but I wanted something with color and possibly a bold print. In the end, I think we came to a good compromise; here's what we have so far. We both fell in love with this light-weight, geometric printed white quilt from The Black Goose that will act as our beds "base". Then on top of that we decided to put a graphite colored, linen duvet cover from Restoration Hardware at the end of the bed. We priced out nice quality duvet covers, and surprisingly, Restoration came back with the best color selection AND price point. Although, we decided to buy the insert for our duvet at Costco, which has worked great and saved us about $100, compared to the one at RH. 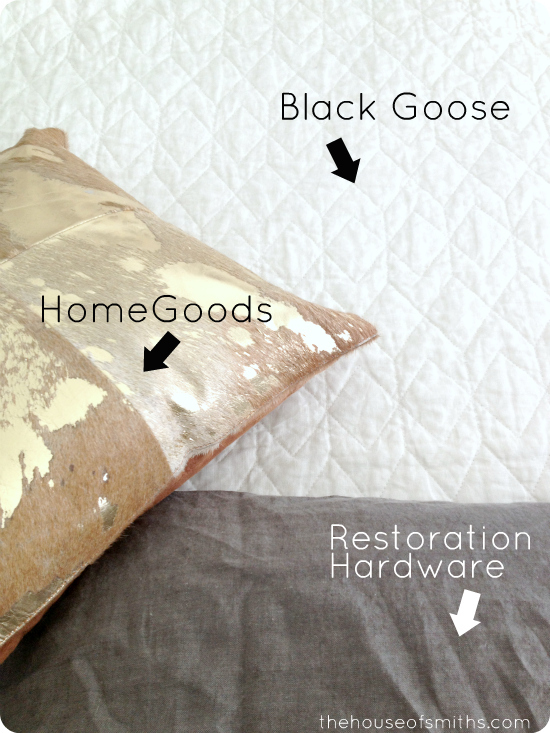 The faux animal hair and gold accent pillow was actually one of the very first things that I picked up at HomeGoods, and I've been using it as a "style guide" for everything I do in this room. For some reason, it's the thing that melts me and Cason's "feel" for the room together perfectly. The hard and soft, the raw/masculine with the dainty/feminine vibe... there's just something about it that inspires me; not to mention that the texture it has is AWESOME! Oh, duh! And of course, the actual BED, that I totally spaced even talking about! We had originally ordered a gray tufted headboard online that we thought we would love, but it wound up being way too short, and Cason was NOT a fan of the tufting at all. So then we toyed around with DIY'ing a headboard and footboard for our room, but after calculating out the material costs (quality wood, tools, high-end upholstery fabric) and time spent making one + know-how, the cost of ordering a custom piece during an annual upholstery sale, was almost the same price! The headboard measures over 70 inches tall, which I LOVE, because that means we don't have to decorate the wall above/behind it, and we're still waiting on the footboard that will have the same profile as the headboard, but shorter. It should be here very soon though, so I'll share the finished look once it comes. The last thing in here that I wanted to share was our new rug. Yes people, it's a RUG ON CARPET, again. ha!... and we LIKE it! :) Actually, we LOVE it! I'm making a big deal out of this, because SO MANY of you have expressed your dislike for how we put rugs on carpet, but I'm sorry, I can't stop! I just love me a good area rug because it can totally make a space! Tile, hardwood, laminate, carpet... In my mind, EVERY room should have a rug somewhere. The End. Normally I'm not a huge fan of these thinner rugs, because they tend to slide around and shift all over the place, but on carpet, they are PERFECT! We haven't had any problems at all, and the best part about this particular rug is that it's light and airy, so it completely brightens up the space and breaks up all that brown carpet we have, BUT has this great pattern that still hides stuff, if anything should accidentally spill. Like, I dunno, applesauce, yogurt, or maybe a little lip gloss (?) ugh, kids! Luckily this rug has cleaned up really, really well when we've needed to get things out of it, and even though a ton of it is bright white, I would pick it again in a heartbeat. We've got a few more updates to share in this space, since we've waited so long to post about anything, so we'll make sure to come back with more updates soon! I am a rug on carpet gal too. 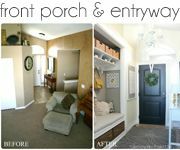 I agree with the notion that all rooms get a boost from the perfect area rug, carpet or not! I know, that's the hardest part, but once you find the RIGHT inspiration piece, things really come together :) Best of luck!!! just a thought about matresess, we bought one at costco since that's just the easiest and cheapest way to do things. within one year we were hurting! it was sagging and my husband was dying of back pain. we went to american matress company. i'm not recommending them per se but just that going to a matress store is worth it in the long run. he asked about our sleep preferences and made us really lay there with pillows and test them out. they are always going to be a little softer in the store than when you get them. we chose one a little firmer than i prefer but after a few nights i was used to it and loving it. just my thoughts... can't wait to see it all done! PS: SO happy to see your BHG feature on Instagram just recently! Congratulations girly! That's a dream of mine! I bow to your awesomeness!!! I think it's a Robert Allen fabric, if I remember right :) http://bit.ly/19rMXMP But I DO love the Chaing mai pillow covers as well. They are FABULOUS! I'm obsessed with that pillow. Who makes it and do you know the name? Can't wait to see the room come together! Shelley: I emailed you awhile ago about my husband disliking carpet on carpet, for the reason that it tends to wear out the carpet underneath. But carpet is extra durable these days, and since you don't walk on it non stop, no worries.....and it looks fantastic! I was just in The Black Goose at the end of August when I was in Utah for Swiss Days. Love it there and the ladies are so kind. Oh yeah! I remember! I loved your insight and appreciated it, Thanks! That is the pillow to end all pillows - totally worth the squeal. I love it!! HA! Thanks! I love your blog. I've been checking it every day now after being a casual reader. Thanks for all the inspiration! Would you ever consider doing a 'look book' post about bedding? I am just so struggling with it right now, I can never find what I want and have a hard time layering. Any awesome ideas? Cant wait to see the final results! I love the pillow! We have some pieces of our bedroom in place, but the bed is lacking. We need it all mattress, sheets, quilt, etc. I find that to be the hardest thing to buy! Both the mattress shopping (why is it sooo confusing?) and the fabrics. I need to find that one piece to start from. I know! 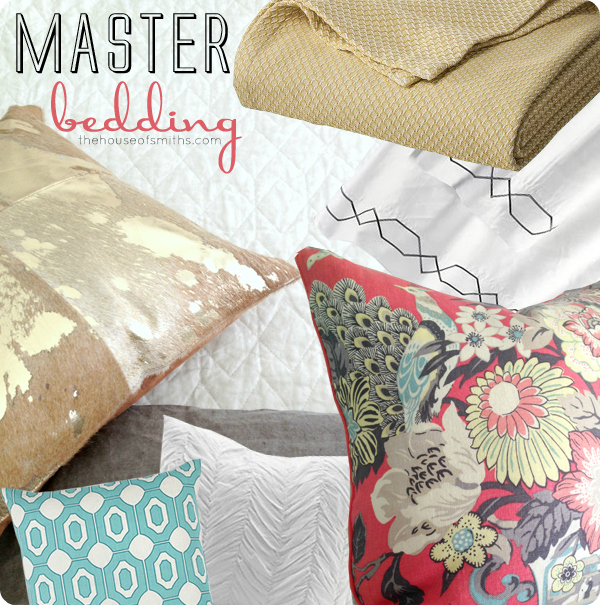 Bedding is SUCH a hard choice, because it's SO defining, and you want to buy quality stuff, so you're comfortable... right!? I am a great fan of stripes! Love your headboard, can't wait to see it with the footboard. I love that rug! where did you get it? 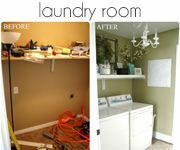 I am loving your inspiration board for your room. Can't wait to see how it turns out. That pillow is pretty much amazing. As is the gold one. Love them both! I love the white bedding! I have been ogling some from Pottery Barn. But, they are kind of pricey. Ooo! They have good coupons, have you subscribed to their emails? That's how I bought my lights for our bedroom. They had a free shipping coupon (saved me $40) and then they were on discount! It's going to be beautiful! I can't wait to see the final reveal! I'm totally laughing because I thought that I definitely should have an image of myself with the happy face to show my readers just how excited I am about certain things. Then I thought- oh I would be using it WAY too often. That being said- seeing that tells me that we would have SO MUCH FUN shopping together. :) LOVE the color scheme. Love that rug! Looking forward to seeing it all come together. We inherited a floor covering business from my husband's father, which he started in 1946. We live in the SF Bay Area. I am convinced no one knows floors better than my husband since he has laid carpet since he was 12 (he's still on the right side of 60). Carpet on carpet is what wears the bottom carpet out because of the stiff backing. Rugs are usually soft, but still cause friction when you walk on them and they are on carpet. Carpet is pretty indestructible nowadays, and the backing is less stiff. Still it makes my husband sweat bullets when he sees carpet on carpet. Probably his knees reminding him how miserable it is to lay carpet in the first place. All hail to floor coverers....carpet or anything else. It's very very difficult and takes a skilled hand and brain. love the whole look! Did I miss it, I really love the gold/tan blanket /quilt thing in the top right hand corner. What is it and where did you find it? Thanks so much. The gold blanket is from Target. It's SO NICE and I found it on clearance for like $24.99... but ONLY in the gold color (?) The blue and white versions were still $59.00. Weird right? What's wrong with a rug on carpet? In the winter it sure makes the floor feel warmer. I know from experience. Your rug looks great with all your new goodies, what fun for you. Who knew it took so much deciding just to dress your bed? The carpet we inherited is awful so one of first things I did was put rugs over it as much as possible. I have summer and winter rugs for living room and our bedroom. They feel great under bare tootsies. Our mfg. home doesn't have a foundation under it so in winter the ceramic tile floors are so cold I put rugs anywhere I can put one but especially over the ugh carpets. I'd rip it out and just have the rugs on the floors but hubs says no. But why? The carpet really is awful. Enjoy making your room pretty, it sure is fun isn't it? Will look forward to seeing the final result. Hey! I think this fabric pattern is Eliza's Garden in Salem Red. I've been stalking this fabic. ;) Would you call it more of a coral or red? Red scares me a bit but I loooove coral. I'd also seen the gold blanket on super sale the last two times I was in Target. Stopped in there last night, and it was no longer there. Boo! And it's $49 online...so weird! For some reason, they get a bad rep...but give Sleep Number beds a whirl next time you're near a store. You can EACH have your own desired firmness and can sleep like babies next to each other. In the SAME BED! They are more affordable than we originally thought, too. Check them out. Hopefully it will solve all of your worldly problems! My husband and I chose our mattress nearly 12 years ago when while staying in a W Hotel...the Heavenly Bed mattress. When it came time to buy a mattress for our king size bed, we knew exactly what we wanted. If you can, stay in a W and try the mattress...you wouldn't think of buying another mattress ever again. We've had ours for 8 years and it is still as if it is brand new. Love it! Oooh girl, I love that pillow too! So glad you went for it! Beautiful, beautiful plans for the room-- can't wait to see how it all turns out! Yeah, there are somethings you glance at a store and you know you must have it, especially for the bedrooms such as linens.